The Eureka Studio is set on a secluded one acre property up in the Byron Bay Hinterland, not far from the vibrant Northern Rivers region. Private and comfortable, it is ideal for a quiet romantic getaway. It provides everything you are looking for to shake off those city blues. Relax on the terrace, swim in the large freshwater pool, wander around our lush tropical gardens & pick fresh herbs, citrus & vegies (when available) for your evening barbeque. Situated an easy 25 minutes drive from Byron Bay, Suffolk Park and Broken Head, 10 minutes from Bangalow, and only 20 minutes from Lismore. 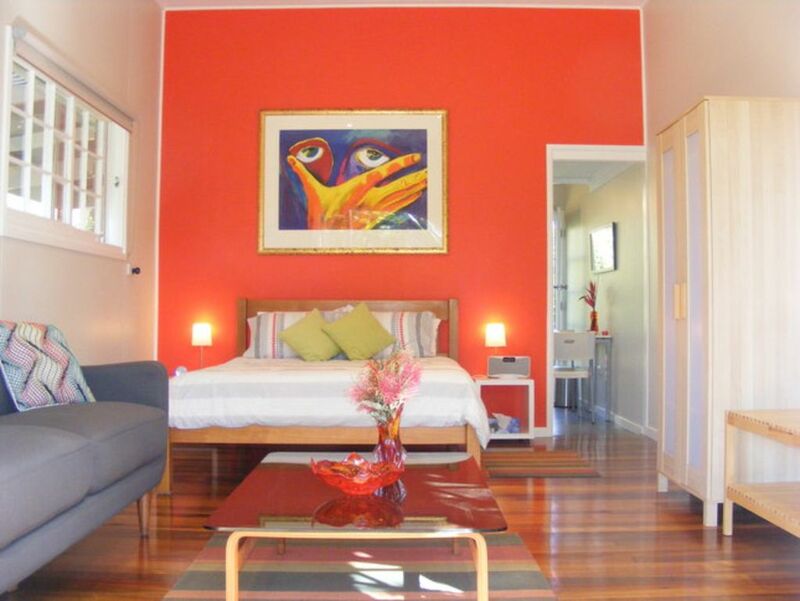 The studio is semi-detached and fully self contained, suitable for 1 or 2 people and is conveniently located for exploring the Byron Bay region. Visit historic Bangalow, wander around the local markets held every week in nearby villages like The Channon, Mullumbimby & Brunswick Heads. Take in the breathtaking views from Minyon Falls, only twenty minutes drive away, or swim in the ocean at one of the many beaches. Byron Bay and all it's delights are only 25 minutes away. The perfect place to relax and unwind, enjoy a BBQ by the pool or a walk through the tropical surrounds. The studio has all you need. Double doors open onto a covered terrace leading to the pool and garden area. The lounge/bedroom has a comfy queen size bed, lounge, TV with all digital channels, DVD/CD player and a Bluetooth stereo speaker so you can play your own music from your device. Wireless internet is also available. There is a fully self contained kitchen with induction cooktop and a microwave, laundry facilities, and separate bathroom. A BBQ is located on the front terrace overlooking the garden & pool. We provide all you need for a light self serve continental breakfast including tea, fresh local coffee, cereals, bread & juice. All linen is provided (including pool towels) and there is undercover parking. * Please note: Due to presence of local native wildlife, and us having our own dog here, we do not allow pets in the studio or on the property. Lovely peaceful beautiful place. Stu and Phil and Miss Saffy were amazing hosts - around when you needed them but not intrusive at all. Bangalow is a lovely perfect little town, much nicer than Byron Bay. This cottage was perfect in every way, very well appointed, comfortable, peaceful and just perfect. Highly recommend!! Peaceful, spotlessly clean and very comfortable. I loved the sunny outlook of the pool surrounded by a beautiful Australian native garden full of birds. The studio itself was perfectly and tastefully appointed. I loved the pool. The dog, Miss Saffie is a joy and was absolutely no trouble. The hosts, Phill and Stu were welcoming and provided delicious items for breakfast. I wish I could have stayed longer! It was a delight to have you stay with us and we are so glad you enjoyed the Studio and it was lovely to chat and share a drink. It is always a joy to have people here and that they enjoy what we have to offer. We would be happy to welcome you back at anytime and were so glad that you could have a peaceful time after your trip overseas. Great stay and very hospitable hosts . Loved the layout of the studio, very comfy ! Lovely and relaxing place to stay. We really enjoyed our week at Eureka studio. Stu and Phil are excellent hosts and gave us information about places to visit that we might not have discovered ourselves. The studio is very comfortable and well set up -some interesting and beautiful artworks on the wall make it a bit more special. The pool is very welcome after a warm day out exploring. Thoroughly recommend. We had a great few days stay here at Eureka Studio in February. The studio is well maintained and equipped, and very welcoming with substantial provisions for breakfast, tea and coffee etc. Nothing was too much trouble for our hosts, Phil & Stu, who were on hand to welcome us and offer advice and recommendations on places to visit and eat etc. The surrounding gardens and pool area were peaceful, beautiful and very comfortable, and the studio is an easy drive to Byron Bay, Banagalow etc. We would definitely stay here again and would thoroughly recommend. We stayed for one night this February and for the price we were very happy with our property. The owners Phil and Stuart thought of everything from bread, milk and juice stocked in the fridge, fresh clean linen ready for use and lighting candles around the property at dusk for our pleasure. The property is attached to the main house but very private and the drive in and around this area is just divine. Short drive to a small town with all the things you may need from a pub, to an IGA and more. We will be back for sure!! We are glad you both loved your escape from the big smoke, and enjoyed your stay in our studio. We look forward to having you stay with us again sometime.